I was really surprised when I received this car shade by AlphaShades! Most of us are familiar with those cardboard type car shades and that was sort of what I was expecting. Wow! I was so impressed with this shade. First, it comes in a nice nylon bag that makes proper storage a breeze. Then there is the windshield shade itself, which is large and sturdy and I absolutely love that it folds up to be stored out of the way when not in use. A really happy bonus is the two window shades that are included and that I hadn’t expect. Great product from start to finish! 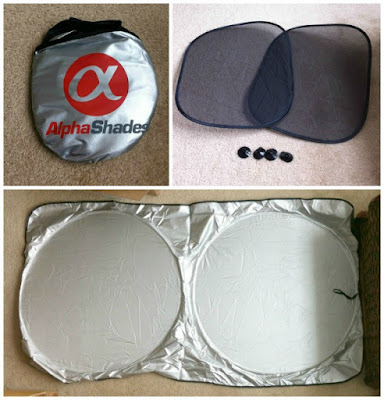 The Car Windshield Sunshade by AlphaShades lists for $39.99 and is currently on sale at Amazon for $13.99. It may be the middle of winter now, but now is also the time to by at that awes dome discounted rate!